Buot Nak: "The Monk Ordination Ceremony"
It was a wonderful surprise to see you again. We have been friends in Miami for almost six years and finally, we met in Thailand. Thank you for inviting me to the Buot Nak for your son Rachawat. Thank you also for giving me some of the basic information regarding the ceremony. Read more about Buot Nak: "The Monk Ordination Ceremony"
Kanchanaburi: The River Kwai. "A First For Me"
I am resting on a chaise lounge, on a raft, after a brief and breathless swim in the swift, churning currents of The River Kwai. Life vests courtesy of the hotel. To my right the sun is disappearing behind the hills across The River. 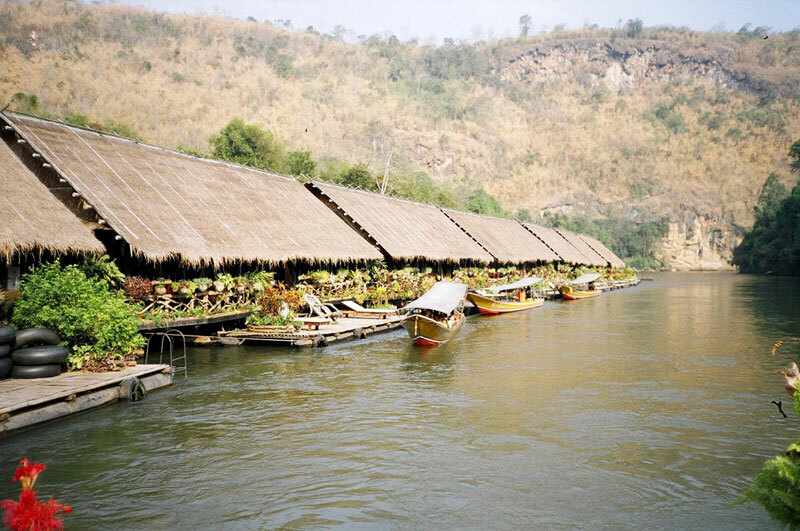 Read more about Kanchanaburi: The River Kwai. "A First For Me"
Sukhothai - Si Satchanalai: "Motorbike with Aun"
I flew north to Sukhothai, checked into The River View Hotel (crummy view of a muddy river) and hired a driver and his tuk-tuk - a small cart with a roof and benches powered by a motorcycle in the rear. The local museum has a colorful display of antique local porcelain. The items are very well marked in English with clear explanations and fascinating stories of The Buddha. There are arrows on the floor that direct visitors around the exhibits. 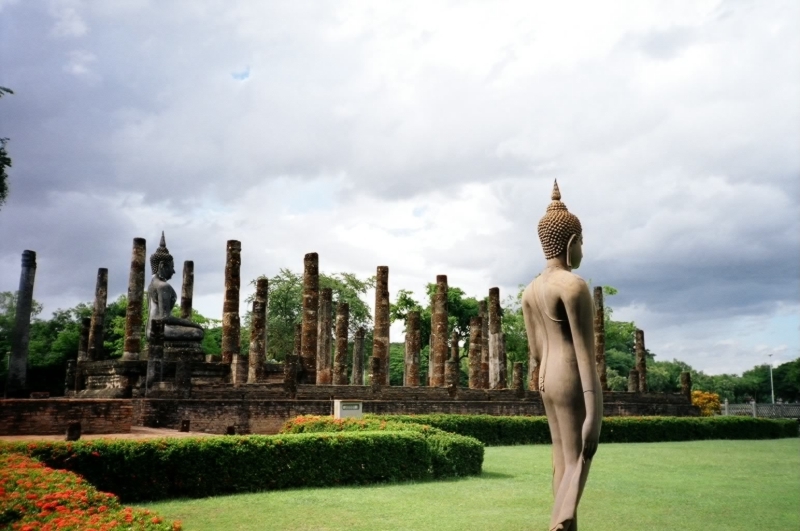 The Sukhothai Historical Park contains a large number of temple ruins and palaces. Ornamental lotus ponds and irrigation systems and a statute of the King Ramkhamheang who invented the Thai alphabet in 1283. The highlight is Wat Sri Chum, a temple housing a massive seated Buddha that measures 11 meters from knee to knee and 15 meters high. As I enter the small and intimate temple with this imposing Buddha, I feel I am entering the "holy of holies." Imagine sitting at the foot of Buddha more than 45 feet high. Read more about Sukhothai - Si Satchanalai: "Motorbike with Aun"